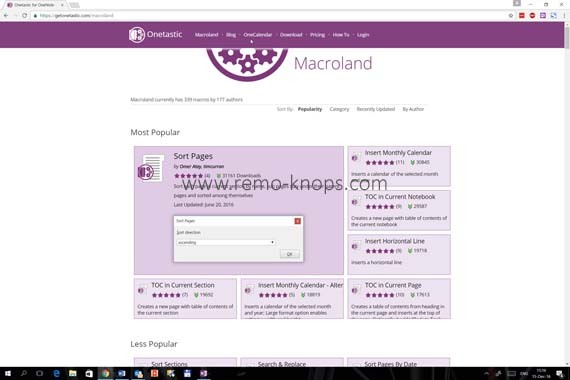 Onetastic is addin for Microsoft OneNote supercharges your OneNote client with macros that can be downloaded from Macroland, a note overview in OneCalendar, Image Utilities, Custom Styles, Favorites/Shortcuts and much more. Driver to give Onetastic for Microsoft OneNote a trie, was the article “Why I’m Dumping Evernote for OneNote” of Sascha Segan on PCMag. I know Sascha from past Mobius Conferences, when he still was writing for Gear Log. Macros are probably known from other Office applications like Excel and Word. 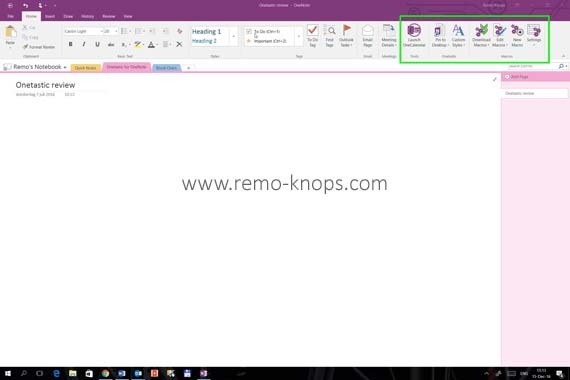 Marcos from Onetastic can be used to perform (simple) repeated tasks in OneNote. The marcos can be downloaded from the Marcoland area on the developer’s website. If you are a developer you can check out the Macro-code and or create your own Onetastic macros. There is documentation available on the Onetastic website. 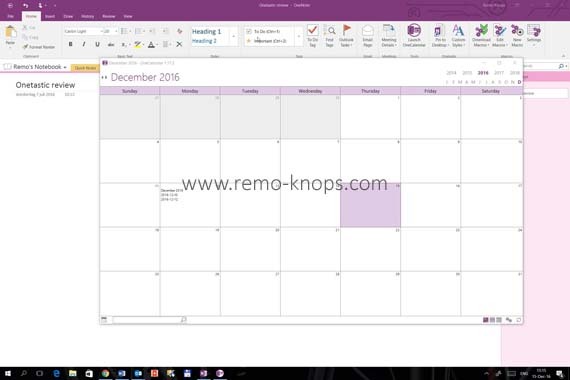 OneCalender is a OneNote tool that helps you search through your notes. For example you need to look-up the meeting notes from 2 weeks ago. Simply open OneCalendar and go to the specific week and open your notes. It’s as simple as that. Furthermore Onetastic adds some additional Microsoft Office functionality. Custom styles are familiar from Microsoft Word, where you can modify and create additional headings and styling. The look and feel is exactly the same as within Microsoft Word. Onetastic also adds image utilities to OneNote. Cropping, selecting text from images, rotating images or printouts are all available from the pop-up menu with a right-click of your mouse. You easily get used to the extra features it brings to OneNote, that it is really hard to stop using it. 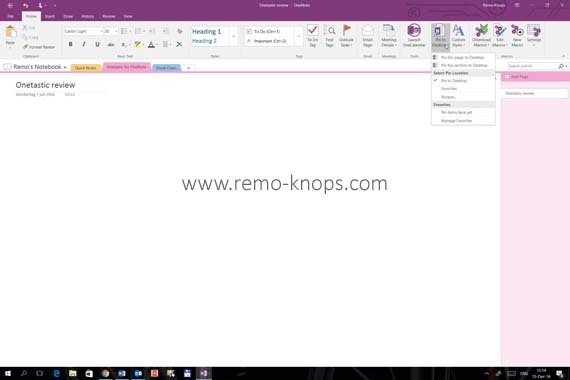 The huge amount of macros available makes it fun to tweak and customize OneNote features to your specific needs. Best of all is that Onetastic is a free tool, that is being developed by a developer at Microsoft OneNote team. Great compliment to Omer Atay for all the efforts he has put into this side project so far, and keep up the good development work. Don’t wait any longer and download the installer and check out the 15-minute Onetastic for OneNote webinar. I hope that Omer Atay can bring the Onetastic addin to the OneNote UWP app for Windows 10. Hey!, I found this information for you: "Onetastic addin for Microsoft OneNote". 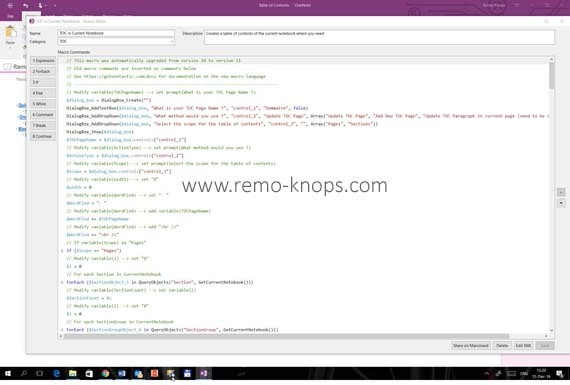 Here is the website link: https://www.remo-knops.com/5390/onetastic-addin-microsoft-onenote/. Thank you.